Not to be confused with E/R. ER is an American medical drama television series created by novelist and medical doctor Michael Crichton that aired on NBC from September 19, 1994, to April 2, 2009, with a total of 331 episodes spanning over 15 seasons. It was produced by Constant c Productions and Amblin Television, in association with Warner Bros. Television. ER follows the inner life of the emergency room (ER) of fictional County General Hospital in Chicago, Illinois, and various critical issues faced by the room's physicians and staff. The show is the second longest-running primetime medical drama in American television history behind Grey's Anatomy, and the 4th longest medical drama across the globe (behind BBC's Casualty and Holby City). It won 23 Primetime Emmy Awards, including the 1996 Outstanding Drama Series award, and received 124 Emmy nominations. ER won 116 awards in total, including the Peabody Award, while the cast earned four Screen Actors Guild Awards for Outstanding Ensemble Performance in a Drama Series. As of 2014, ER has grossed over $3 billion in television revenue. 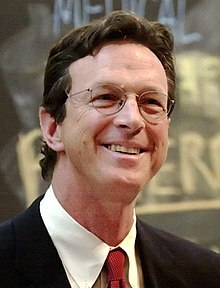 In 1974, author Michael Crichton wrote a screenplay based on his own experiences as a medical student in a busy hospital emergency room. The screenplay went nowhere and Crichton focused on other topics. In 1990, he published the novel Jurassic Park, and in 1993 began a collaboration with director Steven Spielberg on the film adaptation of the book. Crichton and Spielberg then turned to ER, but decided to film the story as a two-hour pilot for a television series rather than as a feature film. Spielberg's Amblin Entertainment provided John Wells as the show's executive producer. The script used to shoot the pilot was virtually unchanged from what Crichton had written in 1974. The only substantive changes made by the producers in 1994 were that the Susan Lewis character became a woman and the Peter Benton character became African-American, and the running time was shortened by about 20 minutes in order for the pilot to air in a two-hour block on network TV. Because of a lack of time and money necessary to build a set, the pilot episode of ER was filmed in the former Linda Vista Hospital in Los Angeles, an old facility that had ceased operating in 1990. A set modeled after Los Angeles County General Hospital's emergency room was built soon afterward at the Warner Bros. studios in Burbank, California, although the show makes extensive use of location shoots in Chicago, most notably the city's famous "L" train platforms. Warren Littlefield, running NBC Entertainment at the time, was impressed by the series: "We were intrigued, but we were admittedly a bit spooked in attempting to go back into that territory a few years after St. Elsewhere." After Spielberg had joined as a producer, NBC ordered six episodes. "ER premiered opposite a Monday Night Football game on ABC and did surprisingly well. Then we moved it to Thursday and it just took off", commented Littlefield. ER's success surprised the networks and critics alike, as David E. Kelley's new medical drama Chicago Hope was expected to crush the new series. Spielberg left the show after one year as a producer, having made one critical decision with lasting effects: the Carol Hathaway character, who died at the end of the original pilot episode script, was retained. Crichton remained executive producer until his death in November 2008, although he was still credited as one throughout that entire final season. Wells, the series' other initial executive producer, served as showrunner for the first three seasons. He was one of the show's most prolific writers and became a regular director in later years. Lydia Woodward was a part of the first season production team and became an executive producer for the third season. She took over as showrunner for the fourth season while Wells focused on the development of other series, including Trinity, Third Watch, and The West Wing. She left her executive producer position at the end of the sixth season but continued to write episodes throughout the series' run. Joe Sachs, who was a writer and producer of the series, believed keeping a commitment to medical accuracy was extremely important: "We'd bend the rules but never break them. A medication that would take 10 minutes to work might take 30 seconds instead. We compressed time. A 12- to 24-hour shift gets pushed into 48 minutes. But we learned that being accurate was important for more reasons than just making real and responsible drama." Woodward was replaced as showrunner by Jack Orman. Orman was recruited as a writer-producer for the series in its fourth season after a successful stint working on CBS's JAG. He was quickly promoted and became an executive producer and showrunner for the series' seventh season. He held these roles for three seasons before leaving the series at the end of the ninth season. Orman was also a frequent writer and directed three episodes of the show. David Zabel served as the series' head writer and executive producer in its later seasons. He initially joined the crew for the eighth season and became an executive producer and showrunner for the twelfth season onward. Zabel was the series' most frequent writer, contributing to 41 episodes. He also made his directing debut on the series. Christopher Chulack was the series' most frequent director and worked as a producer on all 15 seasons. He became an executive producer in the fourth season but occasionally scaled back his involvement in later years to focus on other projects. Other executive producers include writers Carol Flint, Neal Baer, R. Scott Gemmill, Dee Johnson, Joe Sachs, Lisa Zwerling, and Janine Sherman Barrois. Several of these writers and producers had extensive background in emergency medicine. Joe Sachs was a regular emergency attending physician, while Lisa Zwerling and Neal Baer had pediatrics backgrounds. The series' crew was recognized with awards for writing, directing, producing, film editing, sound editing, casting, and music. 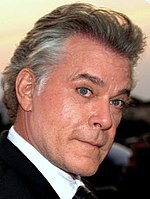 Many notable guests such as Ray Liotta appeared in the series. The original starring cast consisted of Anthony Edwards as Dr. Mark Greene, George Clooney as Dr. Doug Ross, Sherry Stringfield as Dr. Susan Lewis, Noah Wyle as medical student John Carter, and Eriq La Salle as Dr. Peter Benton. As the series continued, some key changes were made: Nurse Carol Hathaway, played by Julianna Margulies, who attempts suicide in the original pilot script, was made into a regular cast member. Ming-Na Wen debuted in the middle of the first season as medical student Jing-Mei "Deb" Chen, but did not return for the second season; she returns in season 6 episode 10. Gloria Reuben and Laura Innes would join the series as Physician Assistant Jeanie Boulet and Dr. Kerry Weaver, respectively, by the second season. In the third season, a series of cast additions and departures began that would see the entire original cast leave over time. Stringfield was the first to exit the series, reportedly upsetting producers who believed she wanted to negotiate for more money, but the actress did not particularly care for "fame." She would return to the series from 2001 until 2005. Clooney departed the series in 1999 to pursue a film career, and Margulies exited the following year. Season eight saw the departure of La Salle and Edwards when Benton left County General and Greene died from a brain tumor. Wyle left the series after season 11 in order to spend more time with his family, but would return for two multiple-episode appearances in the show's final seasons. Goran Višnjić as Dr. Luka Kovač, Maura Tierney as Dr. Abby Lockhart, Alex Kingston as Dr. Elizabeth Corday, and Paul McCrane as Dr. Robert Romano all joined the cast as the seasons went on. In the much later seasons, the show would see the additions of Mekhi Phifer as Dr. Greg Pratt, Scott Grimes as Dr. Archie Morris, Parminder Nagra as Dr. Neela Rasgotra, Shane West as Dr. Ray Barnett, Linda Cardellini as nurse Samantha Taggart, John Stamos as intern Tony Gates, David Lyons as Dr. Simon Brenner and Angela Bassett as Dr. Catherine Banfield. In addition to the main cast, ER featured a large number of frequently seen recurring cast members who played key roles such as paramedics, hospital support staff, nurses, and doctors. ER also featured a sizable roster of well-known guest stars, some making rare television appearances, who typically played patients in single episode appearances or multi-episode arcs. Following the broadcast of its two-hour pilot movie on September 19, 1994, ER premiered Thursday, September 22 at 10:00. It remained in the same Thursday time slot for its entire run. ER is NBC's third longest-running drama, after Law & Order and Law & Order: Special Victims Unit, and the second longest-running American primetime medical drama of all time, behind Grey's Anatomy. On April 2, 2008, NBC announced that the series would return for its fifteenth season. The fifteenth season was originally scheduled to run for 19 episodes before retiring with a two-hour series finale to be broadcast on March 12, 2009, but NBC announced in January 2009 that it would extend the show by an additional three episodes to a full 22-episode order as part of a deal to launch a new series by John Wells titled Police, later retitled Southland. 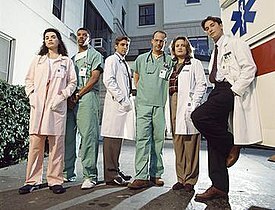 ER's final episode aired on April 2, 2009; the two-hour episode was preceded by a one-hour retrospective special. The series finale charged $425,000 per 30-second ad spot, more than three times the season's rate of $135,000. From season 4 to season 6 ER cost a record-breaking 13 million dollars per episode. TNT also paid a record price of $1 million an episode for four years of repeats of the series during that time. The cost of the first three seasons was 2 million per episode and seasons 7 to 9 cost 8 million dollars per episode. A typical episode centered on the ER, with most scenes set in the hospital or surrounding streets. In addition, most seasons included at least one storyline located completely outside of the ER, often outside of Chicago. Over the span of the series, stories took place in the Democratic Republic of The Congo, France, Iraq and Sudan. One early storyline involved a road trip taken by Dr. Ross and Dr. Greene to California and a season eight episode included a storyline in Hawaii featuring Dr. Greene and Dr. Corday. Beginning in season nine, storylines started to include the Democratic Republic of the Congo, featuring Dr. Kovac, Dr. Carter, and Dr. Pratt. "We turned some attention on the Congo and on Darfur when nobody else was. We had a bigger audience than a nightly newscast will ever see, making 25 to 30 million people aware of what was going on in Africa," ER producer, John Wells said. "The show is not about telling people to eat their vegetables, but if we can do that in an entertaining context, then there's nothing better." The series also focused on sociopolitical issues such as HIV and AIDS, organ transplants, mental illness, racism, human trafficking, euthanasia, poverty and gay rights. The Africa episodes of ER were discussed in a scholarly article by Julie Cupples and Kevin Glynn published in the Annals of the Association of American Geographers in 2013. Other episodes used more creative formats, such as the 1997 live episode, "Ambush" performed twice; once for the east coast broadcast and again three hours later for the west coast, and 2002's "Hindsight" which ran in reverse time as it followed one character, Dr. Luka Kovac, through the tragic events of one Christmas Eve shift and the Christmas party that preceded it. The episode "Brothers and Sisters" (first broadcast on April 25, 2002) begins a crossover that concludes on the Third Watch episode "Unleashed" in which Susan enlists the help of Officers Maurice Boscorelli and Faith Yokas to find her sister and niece. ER was filmed in 16:9 widescreen from the start, even though it was not broadcast in widescreen until the seventh season when it began appearing in the 1080i HD format. Since the sixth episode of season 7, it has appeared in letterbox format when in standard definition. As a result, the U.S. DVD box set features the widescreen versions of the episodes, including those episodes originally broadcast in 1.33:1 (full frame) format. The episodes also appear in 1080i widescreen when rerun on TNT HD and Pop, though the first six seasons still run in full frame 1.33:1 on the digital TNT network. Only the live episode "Ambush" at the beginning of the fourth season and the title sequence for the first six seasons originated in the 1.33:1 aspect ratio. US seasonal rankings based on average total viewers per episode of ER on NBC are tabulated below. Each U.S. network television season starts in late September and ends in late May, which coincides with the completion of May sweeps. All times mentioned in this section were in the Eastern and Pacific time zones. Ratings for seasons 1-2 are listed in households (the percentage of households watching the program), while ratings for seasons 3-15 are listed in viewers. In its first year, ER attracted an average of 19 million viewers per episode, becoming the years second most watched television show, just behind Seinfeld. In the following two seasons (1995-1997), ER was the most watched show in North America. For almost five years, ER battled for the top spot against Seinfeld, but in 1998, Seinfeld ended and then ER became number one again. The series finale attracted 16.4 million viewers. The show's highest rating came during season 2 episode "Hell and High Water," with 48 million viewers and a 45% market share. It was the highest for a regularly scheduled drama since a May 1985 installment of Dallas received a 46. The share represents the percentage of TVs in use tuned in to that show. Chicago isn't the main plot setting of ER. Throughout the series ER received positive reviews from critics and fans alike. It scored 80 on Metascore, meaning "generally favorable reviews", based on 21 critics. Marvin Kitman from Newsday gave the show a very positive review, saying: "It's like M*A*S*H with just the helicopters showing up and no laughs. E.R. is all trauma; you never get to know enough about the patients or get involved with them. It's just treat, release and move on". Richard Zoglin from Time stated that it's "probably the most realistic fictional treatment of the medical profession TV has ever presented". Critical reactions for ER's first season were very favorable. Alan Rich, writing for Variety, praised the direction and editing of the pilot while Eric Mink, writing for the New York Daily News, said that the pilot of ER "was urban, emergency room chaos and young, committed doctors." However some reviewers felt the episodes following the pilot did not live up to it with Mink commenting that "...the great promise of the "E.R." pilot dissolves into the kind of routine, predictable, sloppily detailed medical drama we've seen many times before." NBC launched the show at the same time that CBS launched its own medical drama Chicago Hope; many critics drew comparisons between the two. Eric Mink concluded that ER may rate more highly in the Nielsens but Chicago Hope told better stories, while Rich felt both shows were "riveting, superior TV fare." The Daily Telegraph wrote in 1996: "Not being able to follow what on earth is going on remains one of the peculiar charms of the breakneck American hospital drama, ER". In 2002, TV Guide ranked ER No. 22 on their list of "TV's Top 50 Shows", making it the second highest ranked medical drama on the list (after St. Elsewhere at #20). Also, the season 1 episode "Love's Labor Lost" was ranked No. 6 on TV Guide's 100 Greatest Episodes of All-Time list having earlier been ranked #3. The show also placed No. 19 on Entertainment Weekly's "New TV Classics" list. British magazine Empire ranked it No. 29 in their list of the "50 Greatest TV Shows of All Time" and said the best episode was "Hell And High Water" (Season 2, Episode 7) where "Doug Ross (George Clooney) saves a young boy from drowning during a flood." In 2012, ER was voted Best TV Drama on ABC's 20/20 special episode "Best in TV: The Greatest TV Shows of Our Time". In 2013, TV Guide ranked it No. 9 in its list of The 60 Greatest Dramas of All Time and No. 29 in its list of the 60 Best Series. In the same year, the Writers Guild of America ranked ER No. 27 in its list of the 101 Best Written TV Series Of All Time. The series has been nominated for 375 industry awards and has won 116. ER won the George Foster Peabody Award in 1995, and won 22 of the 124 Emmy Awards for which it was nominated. It also won the People's Choice Award for "Favorite Television Dramatic Series" every year from 1995 to 2002. Over the years, it has been won for numerous other awards, including Screen Actors Guild Awards, Image Awards, GLAAD Media Awards, and Golden Globe Awards, among others. Warner Home Video has released all 15 seasons in R1, R2, and R4. The first six DVD box sets of ER are unusual in the fact that they are all in anamorphic widescreen even though the episodes were broadcast in a standard 4:3 format. Only the live episode "Ambush" is not in the widescreen format. In 2018 Hulu struck a deal with Warner Bros Domestic Television Distribution to stream all 15 seasons of the show. In 1996, Atlantic Records released an album of music from the first two seasons, featuring James Newton Howard's theme from the series in its on-air and full versions, selections from the weekly scores composed by Martin Davich (Howard scored the two-hour pilot, Davich scored all the subsequent episodes and wrote a new theme used from 2006–2009 until the final episode, when Howard's original theme returned) and songs used on the series. An ER video game developed by Legacy Interactive for Windows 2000 and XP was released in 2005. In the Mad episode "Pokémon Park / WWER", the show was parodied in the style of WWE. A book about emergency medicine based on the TV series, The Medicine of ER: An Insider's Guide to the Medical Science Behind America's #1 TV Drama was published in 1996. Authors Alan Duncan Ross and Harlan Gibbs M.D. have hospital administration and ER experience, respectively, and are called fans of the TV show in the book's credits. In March 2012, Warner Bros. International Television announced that they would sell the format rights to ER to overseas territories. This allowed foreign countries to produce their own version of the series. In June 2013, Warner Bros. International Television and Emotion Production from Belgrade, Serbia, announced a Serbian version of ER. Urgentni Centar premiered on October 6, 2014 on TV Prva. A Colombian version is also in the works. ^ "About the Hit NBC TV Show ER". NBC. Archived from the original on October 28, 2011. Retrieved October 14, 2011. ^ Tait, R. Colin (November 26, 2014). "Marathon Viewing E.R. : Rewatching Television's Greatest Prime-Time Serial". Flow. ^ Jacobs, Jason (2003). Body Trauma TV: The New Hospital Dramas (illustrated ed.). British Film Institute. p. 24. ISBN 0-85170-880-3. ^ Richard, Zoglin; Smilgis, Martha (October 31, 1994). "Television: Angels with Dirty Faces". Time. Retrieved October 17, 2009. ^ Keenleyside, Sam (1998). Bedside manners: George Clooney and ER (Illustrated ed.). ECW Press. p. 129. ISBN 1-55022-336-4. ^ "Linda Vista Hospital". The Center for Land Use Interpretation. Archived from the original on April 18, 2005. Retrieved June 28, 2009. ^ Carter, Bill (2006). Desperate Networks (illustrated ed.). Doubleday. p. 30. ISBN 0-385-51440-9. ^ a b c d e f g h i "Saying goodbye to 'ER'". Hollywood Reporter. April 1, 2009. Archived from the original on September 18, 2010. Retrieved September 18, 2010. ^ a b c "'ER' closes door, leaves behind satisfying legacy". MSNBC. March 24, 2009. Retrieved June 13, 2010. ^ a b c "Memories of 'ER'". Military.com. March 30, 2009. Retrieved June 13, 2010. ^ Kennedy, Dana (October 17, 1997). "Sherry Stringfield, the Goodbye Girl". Entertainment Weekly. Retrieved December 6, 2011. ^ Albiniak, Paige (February 12, 2009). "Memories of 'ER'". NY Post. Archived from the original on October 19, 2012. Retrieved June 13, 2010. ^ Goldberg, Lesley (22 February 2019). "'TV's Top 5' Podcast: Oscars Preview, Marvel Cancellations Decoded". The Hollywood Reporter. Retrieved 25 February 2019. ^ "After 11 years, Dr. Carter takes leave from ER". ER Headquarters. March 31, 2005. Archived from the original on July 9, 2009. Retrieved June 28, 2009. ^ Levin, Gary (April 8, 2008). "NBC veteran 'ER' will end its run next year". USA Today. Retrieved June 28, 2009. ^ The Futon Critic Staff (December 3, 2008). "Nbc Fallout: "Knight" Cut, "Er" Extended". The Futon Critic. Retrieved June 28, 2009. ^ Schneider, Michael (January 8, 2009). "Wells' 'Police' close to series order, Final season of 'ER' to be extended". Variety. Retrieved June 28, 2009. ^ "ER: Clooney and Margulies Return to Closed Set for a Final Episode". TV Series Finale. January 22, 2009. Archived from the original on January 30, 2009. Retrieved June 28, 2009. ^ BILL CARTERPublished: November 16, 1998 (November 16, 1998). "MEDIA; What Price 'E.R.' Syndication? - New York Times". Nytimes.com. Retrieved March 1, 2013. ^ Fleming, Michael (June 25, 2001). "Dish: 'ER' doc cuts big deal". Variety. Retrieved March 1, 2013. ^ Brooks, Tim; Marsh, Earle (2007). The Complete Directory to Prime Time Network and Cable TV Shows 1946-Present (Ninth Edition). Ballantine Books. p. 1694-1698. ISBN 978-0-345-49773-4. ^ Cupples, Julie; Glynn, Kevin (2013). "Postdevelopment Television? Cultural Citizenship and the Mediation of Africa in Contemporary TV Drama". Annals of the Association of American Geographers. doi:10.1080/00045608.2011.653741. ^ Why The Sopranos and ER put those black bands across your screen. Slate. 6 February 2002. ^ a b "TV Ratings: 1994–1995". Classic TV Hits. Archived from the original on October 26, 2009. Retrieved October 16, 2009. ^ a b "TV Ratings: 1995–1996". Classic TV Hits. Archived from the original on November 9, 2009. Retrieved December 13, 2009. ^ a b "A Milestone Year, for a Decidedly Dubious Reason". Los Angeles Times. May 23, 1997. ^ a b "Top TV Shows For 1999–2000 Season". Variety. August 6, 2000. Retrieved September 9, 2011. ^ a b "The Bitter End". Entertainment Weekly Published in issue #598 June 1, 2001. June 1, 2001. Retrieved December 2, 2010. ^ a b "How did your favorite show rate?". USA Today. May 28, 2002. Retrieved October 16, 2009. ^ a b "Nielsen's TOP 156 Shows for 2002–03 – rec.arts.tv | Google Groups". Groups.google.com. Retrieved September 3, 2011. ^ a b "Internet Archive Wayback Machine". Web.archive.org. September 30, 2007. Archived from the original on September 30, 2007. Retrieved September 3, 2011. ^ a b "ABC Television Network 2004–2005 Primetime Ranking Report" Archived April 21, 2012, at the Wayback Machine. (June 1, 2005). ABC Medianet. Retrieved November 6, 2007. ^ a b "ABC Television Network 2005–2006 Primetime Ranking Report" Archived October 11, 2014, at the Wayback Machine. (May 31, 2006). ABC Medianet. Retrieved November 6, 2007. ^ a b "ABC Television Network 2006–2007 Primetime Ranking Report" Archived March 23, 2012, at the Wayback Machine. (May 30, 2007). ABC Medianet. Retrieved May 31, 2011. ^ a b "ABC Television Network 2007–2008 Primetime Ranking Report" Archived April 13, 2010, at the Wayback Machine. (May 28, 2008). ABC Medianet. Retrieved July 3, 2009. ^ a b "ABC Television Network 2008–2009 Primetime Ranking Report" Archived April 10, 2014, at the Wayback Machine. (June 2, 2009). ABC Medianet. Retrieved May 31, 2011. ^ Littleton, Cynthia (April 3, 2009). "'ER' series finale scores with auds". Variety. ^ "ER - Season 2, Episode 7: Hell and High Water". TV.com. ^ Hammond, Michael; Mazdon, Lucy (January 30, 2007). The Contemporary Television Series. Edinburgh University Press. p. 219. ISBN 0-7486-1901-1. ^ Cosgrove-Mather, Bootie (April 2, 2002). "TV Guide Names Top 50 Shows". CBS News. Retrieved December 24, 2010. ^ "The New Classics: TV". Entertainment Weekly. June 18, 2007. Retrieved February 6, 2012. ^ Hughes, Jason (September 19, 2012). "'Best In TV: The Greatest TV Shows Of All Time': Which Classic Comedy Is America's All-Time Favorite? (VIDEO)". The Huffington Post. Retrieved June 4, 2013. ^ "'101 Best Written TV Series Of All Time' From WGA/TV Guide: Complete List". Deadline Hollywood. PMC. June 2, 2013. Retrieved June 4, 2013. ^ "2005–2006 Primetime Emmy Awards Facts & Figures". Academy of Television Arts & Sciences. 2006. Retrieved 2009-10-16. ^ "ER (1994) - Awards". Internet Movie Database. Retrieved 2009-10-16. ^ Littleton, Cynthia (2018-01-14). "'ER' Finally Makes Streaming Debut With Hulu Pact". Variety. Retrieved 2018-06-22. ^ "E.R. : Original Television Theme Music and Score - Original TV Score : Songs, Reviews, Credits, Awards". AllMusic. Retrieved June 8, 2013. ^ Adams, David (2005-05-31). "ER Admitted to Retail". IGN. Retrieved 2019-03-03. ^ "Warner Bros Will Begin To Sell ‘ER’ Format Rights Overseas" Archived July 7, 2012, at the Wayback Machine. Warner Bros. International Television Distribution via Deadline Hollywood (March 28, 2012). ^ "Potraga za srpskim Džordžom Klunijem". Retrieved 2016-08-26. ^ inbox-online.com. "Serija". Retrieved 2016-08-26. ^ Tartaglione, Nancy (January 24, 2014). "Global Showbiz Briefs: Colombia Orders 60 Episodes Of ‘ER'; ‘Tbilisi, I Love You’ Hits Georgia Theaters In February; More". Deadline Hollywood.